On a sheet of paper, list your name, address, and phone number, optionally list your special interests and mail it with a check for $30 (made out to CAMA) to: Connecticut Antique Machinery Association, P.O. Box 425, Kent, CT 06757. Receiving our CAMA newsletter by mail and all other special mailings and event information. Free admission to our spring Power-Up, annual meeting and steam-up/gas-up events (with valid membership card). Free admission to our Annual Fall Festival (with valid membership card). The Connecticut Antique Machinery Association, Inc. musuem village was incorporated in 1984. Through the years, member/volunteers cleared the land, laid the track for our railroad, and put up the exhibit buildings. The museum continues to grow. The Connecticut Antique Machinery Association, Inc. is a non-profit 501 (c) (3) organization, which is run by volunteers and has no paid employees. Volunteering at the Connecticut Antique Machinery Association museum offers a level of involvement beyond that of the casual visitor. The museum has volunteer programs for everyone young and old. Volunteers younger than 18 must be accompanied by a parent or legal guardian. Those who work during the week can get involved at CAMA on the weekends. As a volunteer, you become a member of the museum family and learn about the agricultural and industrial machinery that made America great. 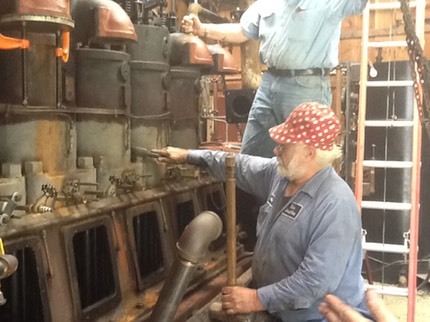 As a volunteer, you can also learn how our antique machinery operates, and eventually, operate it yourself. Volunteer activities enable you to participate in and support the museum's education and research programs while meeting and sharing time with people of similar interests. Our volunteers provide an invaluable service to the museum. Since there are no paid staff, this group of talented and dedicated individuals is responsible for the entire operation. Volunteer assignments are varied and range from administrative responsibilities to equipment restoration and operation. Volunteers make up our docent staff and learn while they are teaching others. The museum relies on the volunteer staff to interpret and protect its collection while enhancing the visitor's experience. The volunteer's commitment is critical to the museum's operation and success. Joining the volunteer program promises to be rewarding, challenging, and enjoyable. Many volunteers do hands-on work equipment restoration and operation while other do administrative or clerical work. Some volunteers work behind the scenes with exhibit design, grounds keeping, or building maintenance. Others are out front working with the public. Many volunteers perform a wide variety of functions. All volunteers will receive training where necessary. Much of the training is obtained one-on-one with experienced staff members, much like an apprentice. Prospective volunteers should be willing to commit to at least one or two days per montb. Some volunteer positions have specific requirements, but for most positions, no specific prior work experience or special skills are needed. 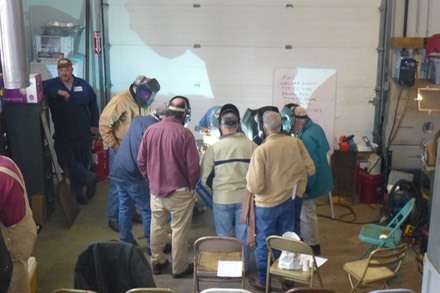 IF YOU THINK YOU MIGHT BE INTERESTED IN VOLUNTEERING AT THE CONNECTICUT ANTIQUE MACHINERY ASSOCIATION, WE WOULD LIKE TO HEAR FROM YOU. To register to be a volunteer send an email to us using using the email form on the right side of this page. Also, please list your areas of interest, and/or expertise as well as what you would like to volunteer for, if you have a preference.